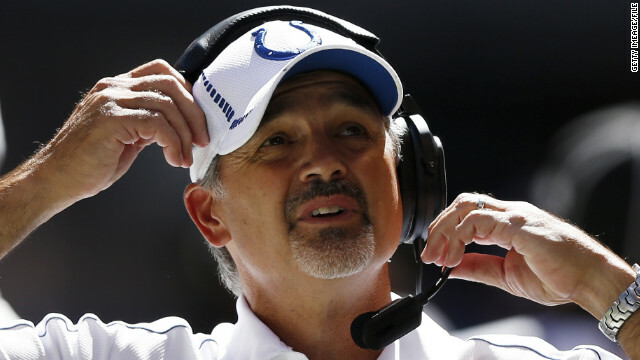 Pagano is in his first year with the Indianiapolis Colts after spending four seasons as defensive coordinator for the Baltimore Ravens. Indianapolis Colts head coach Chuck Pagano has been diagnosed with leukemia, according to team owner Jim Irsay, and the coach's doctor describes it as a highly treatable form of the disease. "I am very optimistic that he will beat this thing," Irsay said during a news conference Monday. Offensive coordinator Bruce Arians will take the team's helm during Pagano's absence, the owner said. For patients who are promptly diagnosed with APL, the "disease-free survival" rate can be as high as 90% if the patient undergoes certain treatment regimens, the institute says. Dr. Larry Cripe is overseeing Pagano's treatment. He said he doesn't know when Pagano will be able to return to football-related activities. "The goal is to cure the disease," said Cripe. "A cure is usually defined when the cancer is in remission for three to five years." Arians is a cancer survivor himself. He was emotional at the press conference, but kept his composure and tried to rally the Colts players. "We have to move on from today. We are going to get ready for the Packers on Sunday," said Arians. "This football team will survive." According to Irsay, "the coach was feeling fatigue over the last few weeks." He said Pagano had also "noticed some bruising on his body" that he thought had resulted from playing with his grandkids or perhaps some contact during football practice. Pagano's wife urged him to see a doctor when the bruising became more prominent, Irsay said. This is the first season for Pagano as Indianapolis head coach, and his record is 1-2 in his first three games. Prior to this season, Pagano was defensive coordinator for the Baltimore Ravens. Under Pagano, the Ravens had one of the top-ranked defenses in the league last season. Pagano turns 52 on Tuesday. Almost an hour before the press conference, Irsay tweeted words of encouragement for his coach. Though Irsay said it's unlikely Pagano will be "all in as a head coach this season," he said Pagano has already set a tone for coaches and players during his short tenure. Irsay said the team's primary objective now is to get Sunday's game ball after the Green Bay Packers matchup "and walk that into the hospital and put that in his hands." Irsay isn’t the only one rooting for Pagano’s recovery. The Ravens and several NFL personalities also took to Twitter to voice their support. Our thoughts and prayers are with Chuck Pagano and his family. Best wishes to a good man and good coach, Chuck Pagano.